Leisurely Saturday. Revisit Palm Cove. Walk along the jetty. 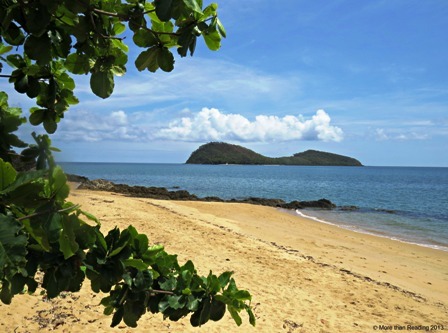 Look over the sea to Double Island. Look back at the shoreline at the sand, sea and rocks. What’s that? 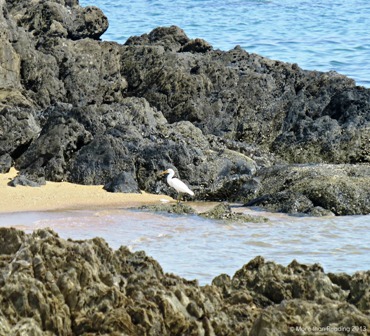 A white bird stands out against the dark rocks. Zoom in with my camera lens. See the white bird more clearly. A white heron? A white bird with a fish in its beak. A largish fish but a long, thin beak on the bird. How did these two come together? Was the fish in the water? Did the white bird pierce the fish with its long sharp beak? 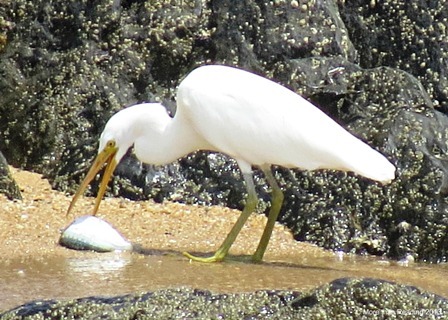 Was the fish dead in the water or on the sand and the white bird found it? Did the fish drop from an osprey or hawk flying overhead? Sometimes the bird stabs at the fish and tries to pick it up again. I haven’t seen this bird before. Exciting… New… Interesting… What is happening now? What bird is it? Not an ibis – they have black on them and a different shaped beak. A white heron? An egret? Later. 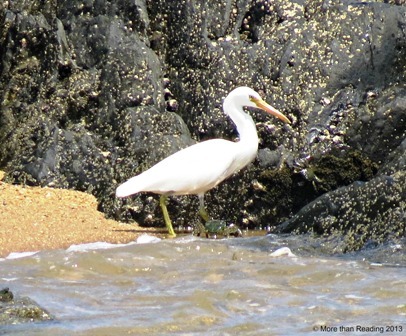 Look up online and find out the bird is an Eastern Reef Egret (Egretta Sacre) Also called a Pacific Reef-Heron. Was it enough for lunch? 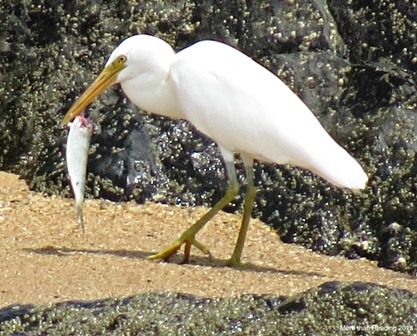 And… how did the Egret get the fish? Thanks Di. 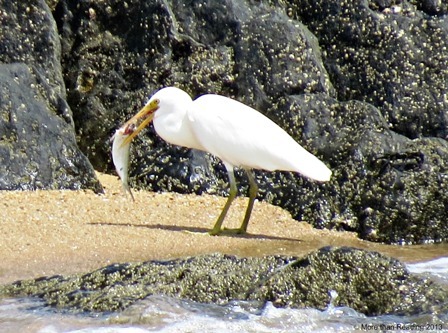 It was a fascinating 15 minutes… and then ‘googled’ later to find out it was a pacific reef-egret.